Home > Take a look! Starting May 4, news of our new Hospital will be all over town. 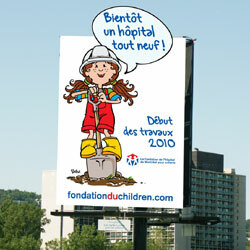 This spring, the construction of our new hospital will be announced above many of Montreal’s major highways. While infrastructure work gets underway around the Glen Campus, the MCH Foundation will launch a lively billboard campaign, once again featuring our adorable ambassador, Shilvi, as part of The Best Care for Children capital campaign. The Foundation continues its fundraising efforts with renewed energy, and with its sights set on the goal of raising $100 million towards The Best Care Care for Children campaign. Its first objective is to promote awareness in Montreal and surroundings areas, and gain new support in the form of donations. “At The Children’s, we’ve been talking about the construction of our new hospital for quite some time now, but outside the hospital, many people are still unaware of the project. It’s time to share the big news that a new pediatric hospital will be built here in Montreal,” says Danielle Gabrielle Roy, Director of Communications at the Foundation.